BigUpRadio.com proudly presents the all new weekly reggae dancehall radio show called “Green Lion Radio Show.” Hosted by DJ and producer Zeke Stern, the Green Lion Reggae show features speciality programming in which Stern curates the program based around a unique theme, exclusive pre-releases from the Green Lion catalogue, one on one interviews and Green Lion’s signature ‘LP Clash’ where seminal albums in the history of the music face off and the listener can decide who wins. 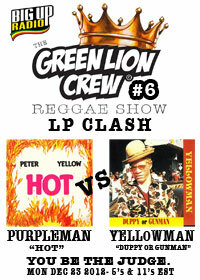 This week Green Lion’s LP Clash plays two LPs back to back and lets YOU be the judge. This week its Purpleman’s 1982 LP “Hot” produced by Prince Jammy up against Yellowman’s 1982 LP ”Duppy or Gunman” produced by Henry “Junjo” Lawes. Don’t miss this show December 24th! Catch the Green Lion Radio Show every Monday on the dancehall station at bigupradio.com. The show times on Mondays are: 5am, 11am, 5pm and 11pm Eastern Standard Time. The Green Lion Radio Show, keeping you up to the time and close to the roots.